Nearly three weeks into its journey around the UK, the Olympic torch has been through Stranraer spending it's first night in our area. It has already visited England, Wales, the Irish Republic and Northern Ireland. John and Edward proudly took the torch through the streets of Dublin. The explorer Chris Bonington carried the torch to the top of Snowdonia in Wales. 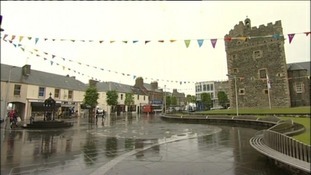 The torch was brought into Stranraer on a ferry. Resting there overnight before continuing its journey north. Next week it returns to our area, travelling down from Edinburgh to Alnwick on Thursday. Then Newcastle, where it will travel on a zip wire over the River Tyne. It will then spend nights in Durham and Middlesbrough before moving on to York, Carlisle, Dumfries and finally Bowness-on-Windermere. From there, it carries on through the country to London for the start of the Olympic Games. To find out exactly where the torch is travelling near you, look on the London 2012 website.